What is the “right” type of beehive? In this article we are going to discuss the various types of bee hives, a little of their history and how to select the one that’s right for you. Flying “Outside the Swarm” is not about following trendy philosophies. We are not old school, nor are we following the crowd. Instead, we fly our own course in these pieces and in so doing look to provide you with a practical approach to successful beekeeping without all the hype. To that end please keep in mind that the idea here is to expose beginners to some of the realities of beekeeping that are frequently overlooked, with the hope of helping the beginner sidestep some of the issues that often trip them up. So let’s get something out of the way right off the bat. The beginning beekeeper would be wise to forgo the discussions over which “box” is better or more “natural” for keeping bees and focus instead on their own understanding of bee biology. In other words, if you want to be a successful beekeeper, you will be better off learning the biology of the bee – what bees do – and coupling that knowledge with the bee’s seasonal habits and natural instincts. Understanding the activities inside the hive is much more important than the wooden box we house our bees in. Prior to keeping bees, humans robbed bee colonies and often destroyed the hive while gathering that prized golden nectar we all love. Some of the best records of mankind moving from hunting for bees and their honey, to beginning to keep bees, come from Egypt. In Egypt, elongated clay pots were used to hive bees. Later, hives of cork and wood were used, in addition to upside down woven baskets called skeps. It is not known exactly when bees were brought to the U.S., but they are not native to North America. It is known that bees were brought here as early as the 1600’s. Among the types of bee hive in common use today, it’s unfortunate the Langstroth hive is often looked down upon sometimes simply because of its association with commercial beekeeping. In the 1800’s the father of modern beekeeping, Rev. Lorenzo Langstroth, made some important discoveries, the greatest of which was probably the discovery of bee space. Bee space is approximately 3/8th of an inch and is the room bees leave themselves to move freely about the hive. Spaces smaller than that are often filled with propolis and spaces larger used to build comb. This understanding allowed for the development of the movable frame which revolutionized beekeeping. The principle of bee space is applied in all types of bee hive today and proper comb spacing is an important design issue. In studies conducted by Tom Sealy in the forests near Cornell University he found that most colonies nested in trees with an opening no greater than two to five square inches. These openings were usually found on the south side of the tree near the bottom of the tree cavity. The average nest cavity had a total volume of about 41 quarts. Today’s beehives integrate most of the characteristics found in wild bee colonies and are more spacious as well. They provide (and bees require) a small entrance that is defensible, a dark enclosure protected from the weather and room to build enough parallel comb to raise brood and store the reserves necessary to see the colony through the winter. This is where flying outside the swarm – otherwise known as educating yourself rather than blindly following trends – will give you a slightly different view of things. There are a number of excellent designs to choose from when deciding on the type of home you are going to give your bees. From Warre (pronounced war-ray), and Langstroth to Top Bar hives, there is not so much in the way of negatives as there are things to make yourself aware of. Before we get into each type of hive let’s remember that we are managing bees, not the box. As I have stated, the best way to manage bees is with an understanding of bee biology, not some magical box. Therefore, the best hive is often the one that best fits the beekeeper and his/her physical abilities and, pragmatically, allows the beekeeper to provide for his or her bees realistically. Finally, a couple thoughts to keep in mind as we look at each type of hive. “Natural” does not mean hands off. This is, after all, a form of animal husbandry. You wouldn’t bring a puppy home, put it out in the backyard and never check on it would you? Second, regardless of what you’ve read, the type of box does not take the place of inspections. Developed by Emile Warre’, the Warre hive is often referred to as the “people’s hive.” His goal in developing the hive was to find a system that was simple, natural and bee friendly. The design is essentially a supered top bar hive that allows the bees to draw out their own comb without the use of foundation. The “supers” or hive bodies, (identical boxes) are smaller than a Langstroth hive body and are designed to mimic the size of a typical tree cavity. When additional space is needed a new box is added at the bottom of the hive which allows the bees to build downward as they are naturally inclined to do. Each super in the Warre hive contains eight top bars that rest at the top of each box. There is no foundation, which forces the bees to draw out their own comb naturally. No frames are used either, though I have seen Warre hives with foundationless frames so I’m sure they’re available if that is what the beekeeper desires. The gabled roof and quilt box that sit at the top of the hive are designed to add insulation and aid in moisture control. The quilt box is usually made of a cotton material and filled with sawdust, straw or wood shavings. The bottom of the hive is similar to the Langstroth but has a smaller opening precluding the use of a reducer. You’ve probably seen these hives in a local beekeeping supply shop and found them to be quite attractive. It’s generally agreed that bees housed in a Warre hive produce less honey, of course there’s nothing wrong with that. Honey is not always the goal of beekeeping. If honey is your goal you may want to consider a Langstroth hive and simply forgo the foundation as the Warre is really nothing more than a miniature Langstroth. Be aware that when adding the next super to this type of hive it is placed underneath the existing supers which can get fairly heavy. Also, note that there is no easy way to add a feeder if you need to feed your bees. Also, no matter the source of information regarding Warre hives, you are going to read about a hands-off approach or some form of reduced inspections. You will also find claims about Varroa mite control. Let’s be clear – though these hives were designed to mimic a “natural” situation better than the other options, they will not control mites. Think about that for just a moment. If wild bees building their own comb inside a tree were devastated by mites (and they were), simulating the same type of hive cavity with a man made box will not control mites either. We will discuss mite control in another article, but do not buy this type of hive with the idea it will control mites. Another thing to think twice about is the hands off approach – or the James Bond method (Live or Let die) as it is sometimes referred to. It is not necessarily good for the bees. The first thing the bees will do is build cross comb (see the end of this article). Eventually the beekeeper will want to open the hive – and discovers a complete mess of cross comb. Cross comb pretty much eliminates hive inspections, unless you are willing to destroy a lot of comb and work the bees have already completed. That’s alright, you say, I wanted to be hands off in the first place. But how then are you going to learn about your bees? You do want to become an informed beekeeper right? To prevent the construction of cross comb you will actually need to make numerous hive inspections, occurring every few days after first introducing the bees to the hive. There is also a less talked about side to the hands off approach to beekeeping. Hands-off often means that when the bees die out, the hive is left abandoned in the backyard. That’s when other bees from healthy hives rob the deadout and take with them mites and any disease that was present in the hive. A hands-off approach to beekeeping is rarely beneficial to the bees and is certainly not beneficial to the beekeeper. It is just not possible to educate yourself and gain the experience necessary to become a successful beekeeper without inspecting the hive. However, with the understanding that more inspections (at least twice a week) are required to prevent cross comb, the beekeeper who wants smaller boxes to lift will enjoy this handsome addition to their backyard. The hive will provide a home similar to a tree cavity and safely house your bees through winter and summer as well. The recent trend to “go natural” has popularized the Top Bar hive (also referred to as the Kenyan Top Bar Hive). Designed after the log hives typically hung in trees in parts of Africa, the Top Bar hive consists of a horizontal hive body with sloping sides and wide slats, or “top bars”, that fit closely together to form the roof. An extra cover is normally added to make it rain proof and various designs of quilt blankets are often laid across the top bars to provide insulation in the winter. With the Top Bar hive there are no “supers” (boxes) to lift, because the hive is a single horizontal unit. These hives can be quite heavy and once you have it in place know that it will be a two person job to relocate the hive. So be sure of your site selection before setting up the hive. Hive inspections are as easy as lifting out a single “bar” (there are no frames) and the bees tend to remain calm because the hive stays closed up, except for the bars that are removed for inspection. Always remember that you must keep the comb vertical so it does not break away from the top bar. Many beekeepers are drawn to this style of hive because the bees are allowed to construct their own comb, without the use of foundation (though none of the hive types discussed here require foundation). An interesting feature of the Top Bar hive is the window in the side of the hive. While it remains shuttered most the time to keep the hive dark inside, the shutter can be swung away so the beekeeper can take a look inside. While this does not replace a hive inspection, it is definitely a fun way to look in on your bees. The bottom of the hive takes after the Langstroth, in that it has a screened bottom with a slide out board. The screen keeps the bees in, but sliding out the bottom board improves ventilation and a sticky board can be used to collect mite fall for mite counts. Keep in mind the same precautions about cross comb apply here that apply to the Warre hive. Numerous inspections will be required to prevent the problems associated with cross comb when first introducing your bees to their new home (see cross comb stories at end of article). The same advantage of bees constructing their comb without foundation applies to both the Warre and Top bar hives (and Langstroth, if you prefer to go that route). When bees build their own comb they build what they need and you will find they build many different sizes of comb to raise brood, drones and store honey. Another advantage of the top bar (and other foundationless hives) is that when bees produce their own wax the comb will not contain the contaminants found in commercial foundation. Essentially, all commercial wax contains acaricides (pesticides used in the beehive to kill mites) and the foundation used in most bee hives is usually coated with wax containing trace amounts of these pesticides. 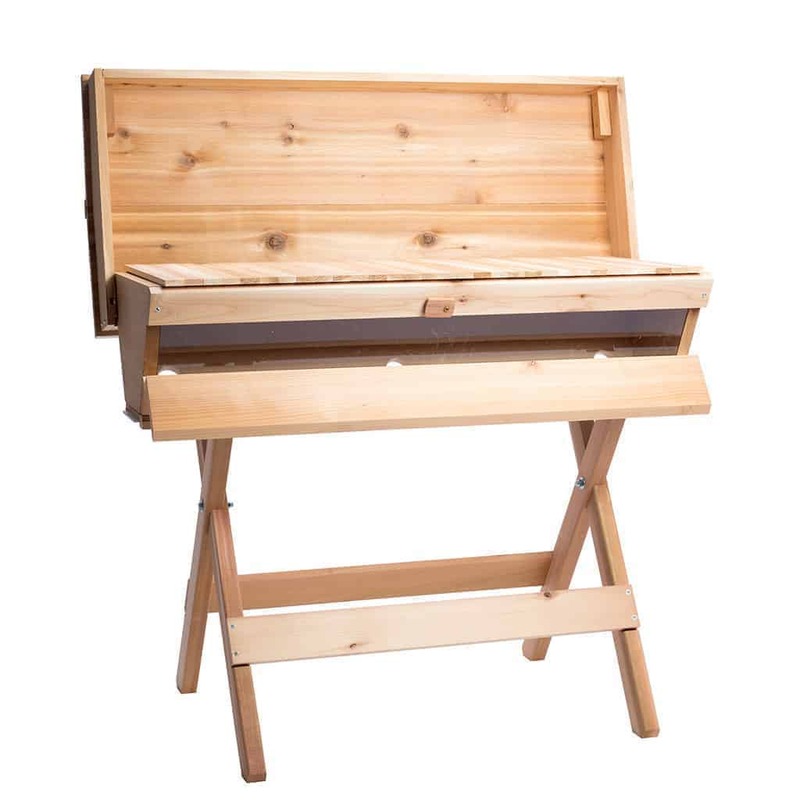 The Top Bar hive is becoming very popular and rightly so. 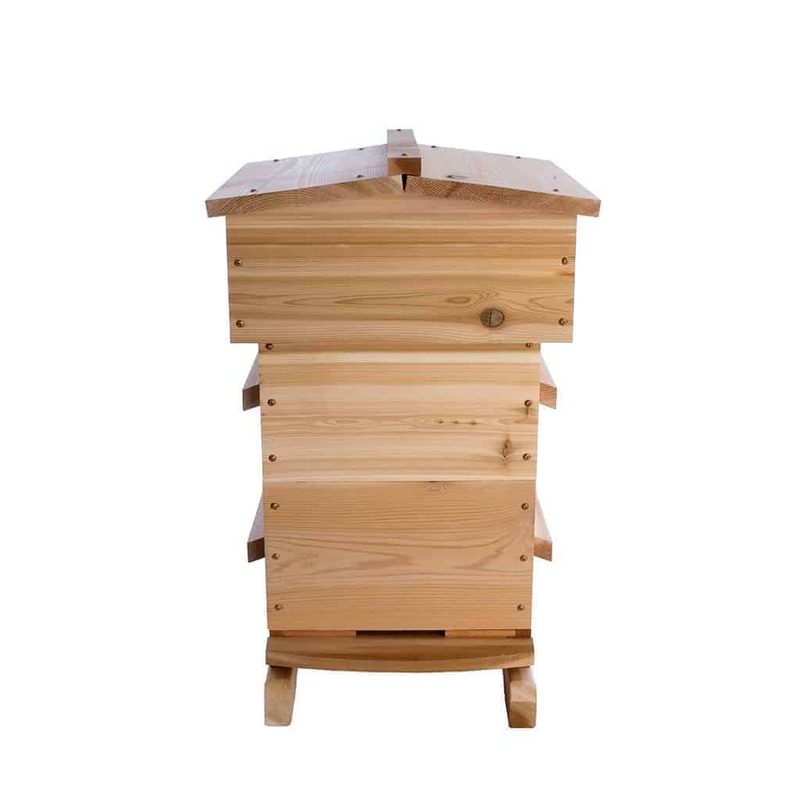 It contains all the elements of a “natural” hive, allowing the bees to draw their own comb without the use of foundation, while providing the beekeeper easy access for inspections. Just remember, as with the Warre hive, frequent inspections (a couple times a week) are required to prevent cross comb when the colony is first getting established and keep in mind that mites are not controlled by the type of hive either. Easily recognized and the most popular hive is the Langstroth. Known as the Father of Modern Beekeeping, Rev. Langstroth invented the Langstroth hive in 1851 after discovering what is referred to as bee space (see above), which allows beekeepers to manipulate frames without destroying comb and harming bees. This discovery and the development of the first practical movable comb (frame) allowed beekeepers to move away from skeps and hollowed logs where the comb was fixed and did not allow for inspections without destroying the comb. Basically, the Langstroth revolutionized the beekeeping world. A Langstroth hive consists of a rectangle wooden box (called a super) with 8 to 10 vertical frames hung inside. The box rests on a wooden bottom board that leaves an opening at the bottom, which serves as the entrance to the hive. There is a removable top, with both an inner and outer cover. When the colony expands and needs more room the covers are removed and an additional super is added to the top of the hive. The 8 frame box is increasing in popularity (instead of 10 frames) because they are not as heavy. Gnerally, the frames that rest inside of each super contain a thin layer of foundation that is imprinted with a hexagonal pattern on which the bees draw out their comb. There is a lot of debate about the use of foundation. It limits the bees to the size of cell imprinted on it and does not allow them to freely draw out comb as they would without foundation. Consequently, more beekeepers that use the Langstroth hive are moving away from the use of foundation and installing frames that are foundationless instead. A foundationless Langstroth hive offers the same benefits to the bees both the Warre and the Top Bar hives. The Langstroth hive is common and standardized, making it possible for the beekeeper to find many resources, both with regards to equipment and mentoring. Remember, from lamp posts, bird houses and sides of buildings, bees call many different places home, as long as the entrance and the cavity are to their liking. The type of box the bees are kept in is much more for the beekeeper than it is the bees, especially when the bees are allowed to draw comb the way they want it. There are many approaches to beekeeping, so in my classes I don’t tell people what to do. I do bring up things for them to consider and I make them aware of potential issues that could cause them problems. Ultimately their preferred type of beehive and how they keep and manage their bees is their own decision and so, for your benefit, I will share some of their experiences from this spring. Just as I have done in this article I made it clear to the class that going foundationless without numerous visits to the hive would result in a mess of comb that would make it difficult to do examinations. Let’s keep in mind these are excited beginners. They are curious, fascinated by bees and they signed up for the classes because they want to become beekeepers, instead of bee buyers. They are motivated people who want to learn, yet, because of what they’d been reading about various hives promoting a hands-off approach and avoiding the use of foundation, their minds were already pretty well made up about things. Though I clearly identified the potential for cross comb, each of them that went foundationless and chose not to inspect the hive every few days did in fact end up with a mess of cross comb. That was alright – it’s how people learn – but my hope is that you also might learn from my sharing of their mistakes. In all the examples below the individuals were installing packages of bees in new hives. In this first situation they were working to correct cross comb problems when the bees absconded. The bees left the hive while they were standing there and they watched as their bees flew away. Who knows why the bees left; possibly because the hive was open too long while fixing the cross comb, but ultimately they lost their bees from that hive. I felt bad for them but they took it in stride as part of the learning curve. Another couple crushed their queen while attempting to correct the cross comb jumble. That’s a high cost to pay, but they admit they’ve learned their lesson. Two other couples got off relatively easy. They didn’t lose their bees or their queens, but they did destroy a lot of comb and brood after finding supers criss-crossed with comb from corner to corner. Their bees survived but a lot of work was lost. Keep in mind these are brand new colonies being established and any lost work makes it that much more difficult for the new colony to make it through their first winter.